Around a month ago I blogged about a skirt I made using a fabric with cats on it. 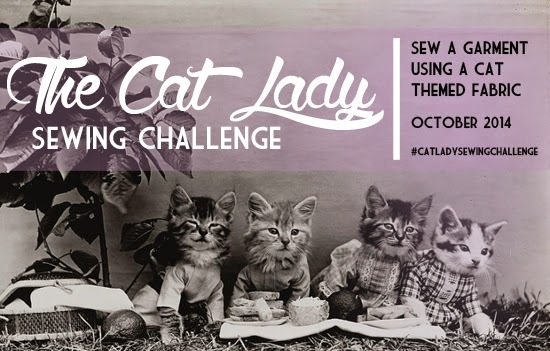 Just before hitting the "publish" button I suddenly had an idea for a Cat Lady Sewing Challenge and asked if anyone would want to join in. There was a good response, so here is the official post: will you join me in making a garment using cat themed fabric? Many of us own and love cats, so I thought a challenge dedicated to our buddies would be a cool way to acknowledge our amazing pets AND would be a good reason to use that crazy fabric we've been eyeing, but haven't had the excuse to buy. This sewing challenge is meant to be fun and casual, not competitive. You have from now through the end of October to complete an article of clothing using a fabric with cats, extra points if there is cat hair on it haha ;) Yes, leopard/cheetah print counts too. I'll do a round up on my blog in the beginning of November and will be giving away a prize to a lucky winner. If you would like to be eligible for the prize please join the Flickr group (here) where you can upload in progress or completed garment pictures, ask for fitting help, and talk with others. Here are some buttons that you can display on your blog, if you would like :) And feel free to hashtag #catladysewingchallenge if you're on Instagram! Um, yes! As a fellow cat lady this challenge is something I cannot pass up! Off to go look for cat fabrics! YESSSS, this is so fun! I've had my eye on some kitteh print fabric for a while now and every time I go to buy it I stop myself, thinking that it's just to twee for real life. Thanks to this I'm justified! I'm going to trot down to the shop tonight to pick it up. Thanks Erin!! Can't wait! I've been dying for a good excuse to buy cat fabric! We should go to Birch and get some Cotton and Steel! I am really looking forward to seeing everyone's cats! Ooooh, I didn't know JoAnn's had some! I'm going to have to check it out. Thanks for the tip! I'm really excited to see what everyone comes up with too! Thanks for joining in! What a great challenge! I've been toying with the idea of getting a cat, it seems like every one has one, and if that's the case, there must be a reason. I even went to PAWS last Thursday to put in an application. My recently acquired lucky cat fabric would be disappointed in me if I said no! Oh my gosh! I love this. I absolutely love cats, but sadly am no longer pet parent to one. I am going to have to hunt around for a fun cat themed fabric so I can participate. This is fantastic! The only sewing challenge I've ever been tempted to participate in. Do you reckon you could do a round up of the best cat fabrics and sources? Hilarious cat prints are slim pickings around here. I want to make a kitty cat top!! Is it the cats at the beach? I am definitely in! I love any excuse to dig into my "cat stash." yay :) time to shop! Replace "dog" with "cat" and I'd be game hahaha, have fun everyone! No, but that sounds awesome. It's been a few months (hopefully it's still there) but I think it involved both cats and dollar bills. Or cats and glasses and suit jackets/bow ties. As a fellow crazy cat lady (and recently inspired by lots of children's wear in the supermarkets featuring all manner of cat designs) I think it is my duty to join in! hahahhaah that would be so awesome!!!! Virtual pub crawl maybe? Make a horse themed outfit! That is so awesome! Is he going to join in?? There are sooooo many cute quilting cottons! I love that you have a cat stash to pull from! Thanks, Jennifer. Are you joining in?? hahah well, I think a dog lady sewing challenge has to happen sometime, right? It's only fair! I totally thought of your cat lady action figure as I was writing this. I'm going to be so jealous if you score some cat knit fabric! I have only seen it once and of course I immediately bought it. You can't pass that up! Awesome! I am debating if I should do a top too. Well, I guess it all just depends on what fabric I find. hahahaahah!!!! I love this comment! Hi Siobhan, I will definitely do that! I have a secret Pinterest board for it now. You can be a cat lady without a cat! It was a few years before I could get one and I would just obsess over all the random cats I saw. The lucky neko? That will be really cool! I have been on the lookout for some, but haven't had much luck. Leopard print works. And so does the cute lion fabric you just bought. I think getting a cat will be one of the best choices you will ever make. Cats are rad! Stella and Lebron are my buds. Count me in...this is a fun idea. What a fun idea! I just purchased some crazy cat fabric a few weeks ago. I was going to stash it until spring because it looks more like a spring/summer print but I might go ahead and make it so I can participate. I can suggest one: eQuilter. They currently have over 100 cat fabrics! I love this idea so much and I really want to participate. However I am only a beginner sewer and do not currently own any cat fabrics. As soon as I do, however, I will get out my sewing things! I really want to! I just need to make time. Hmm...maybe I should go shopping for some cat prints now...! This is an amazing idea. Hopefully I'm not too late to join! Fabulous idea! I have to check for fabrics first. I couldn't resist but to join in. My crazy cat meets acid skirt is now up on my blog and in the Flickr group! This has been fun! This is such a cool idea! Wish I had found out about this sooner. 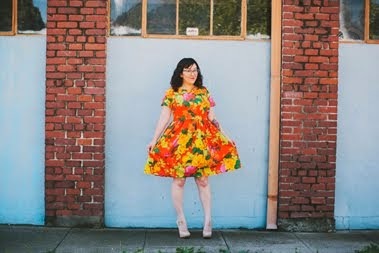 I don't know if this counts, as I made it two months ago, but here's my yellow disco cat Elisalex dress I wore to my cousin's wedding. I'm so sad I didn't see this back when you posted it! I hope you repeat the challenge again this year.